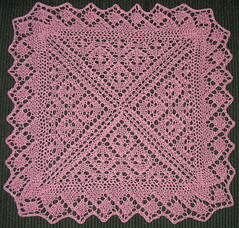 Here is a pattern for a cloth made with size 3 Mercerized Cotton. 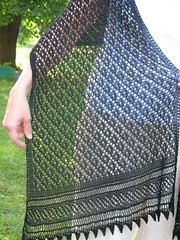 I've been looking through stitch pattern books for patterns I think would make into nice cloths. I hate to say dishcloths because I think these would make nice face cloths as well. 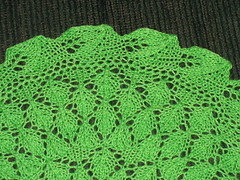 I added the borders to the stitch pattern...and viola! A new dish/face cloth pattern! It's 58 stitches on size 3 needles. 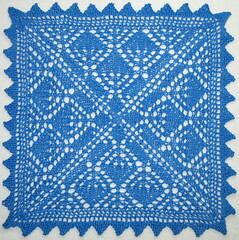 The pattern is charted but is very easy to read. You read the odd rows, right to left. The even rows, left to right. This cloth looks the same on both sides. That's a beautiful washcloth! 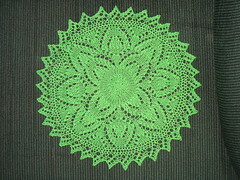 I'm anxious to try it - I'm always looking for an elegant pattern for quick gifts. I put this into a table like you have, and it's sped up my knitting of this pattern considerably. I no longer have to think, "even row, dot means knit" and so on. When I show what I've knitted so far to my friends (I'm starting on the 6th repeat now), they love it! Thank you very much for sharing. 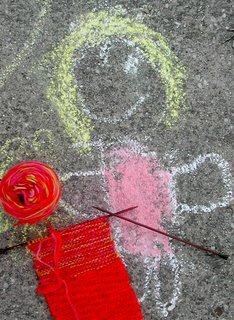 I am a Confessional LC-MS Lutheran, homeschool mom, and knitting fool.